For 3 years during college, I was lucky enough to work for the Ancient Department at the Yale University Art Gallery. During my last year, I was chosen for the Goodyear Fellowship, which allowed me to the spend the year researching and developing programming on ancient music. My research into ancient Greek music specifically inspired both a new YUAG educational program and my thesis! I designed the educational program to use images of ancient Greek musicians and musical contexts to teach middle-high school students about ancient Greek culture and the social importance of music. 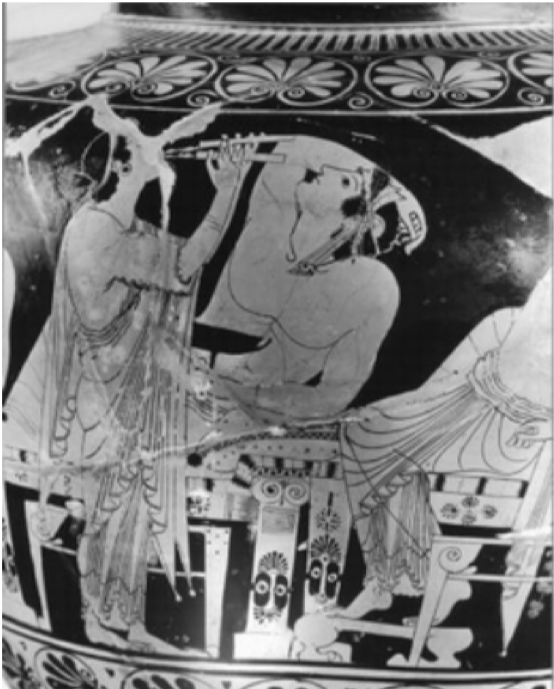 In my thesis, I explored the function of “aulos” music and imagery at the Greek symposium. You can learn more about my work as the Goodyear Intern OR read my thesis OR listen to a 10-minute Dionysian Possession Podcast, for which I used my Yale thesis to interpret the RISD Museum’s “eye-cups” (photos below).